Palestinian Teen Protest Icon Released From Israeli Prison Seventeen-year-old Ahed Tamimi, who has become a symbol of Palestinian defiance, was released after serving an eight month sentence for slapping Israeli soldiers. Ahed Tamimi hugs her father Bassem after she was released from an Israeli prison Sunday after serving an eight month sentence. Seventeen-year-old Palestinian activist Ahed Tamimi has been released from Israeli prison after serving an eight-month sentence for slapping Israeli soldiers during a confrontation that went viral on the Internet. The teen has become a symbol of resistance for many Palestinians; for many Israelis, she's seen as a provocateur. Tamini was greeted by jubilant crowds in her village of Nabi Saleh, in the Israeli-occupied West Bank, as she smiled and embraced family members. "Power to the people," she said. "The people can decide their way of resistance." Tamimi called for continued resistance to Israeli occupation. Last year, her mother posted a video on social media that showed her kicking and slapping Israeli soldiers outside her family home. It went viral and led to her arrest in December. Her trial opened in February at an Israeli military court and in March she agreed to plead guilty to charges including assault. "As part of her agreement, Tamimi pleaded guilty to four counts of assault, including the videotaped slapping of an Israeli soldier," according to the Israeli newspaper Haaretz. "In addition to the eight month jail sentence, she was to pay a fine of 5,000 shekels ($1,437)." Her mother Nariman was also released on Sunday. 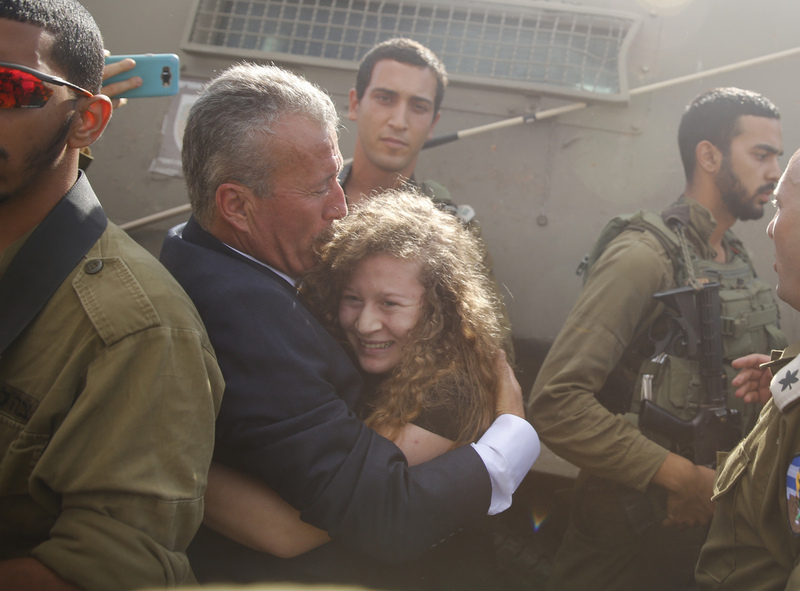 Asked if she'd do it again — slap the soldiers the way she did — Tamimi said she couldn't say much for fear of re-arrest. "I hope that the occupation will be gone so I won't even think about doing these things again," she added. Palestinian President Mahmoud Abbas met with Tamimi and her family after her release. According to a statement released by the official Wafa news agency, Abbas "praised Ahed and described her as a model of the Palestinian struggle for freedom, independence and statehood." 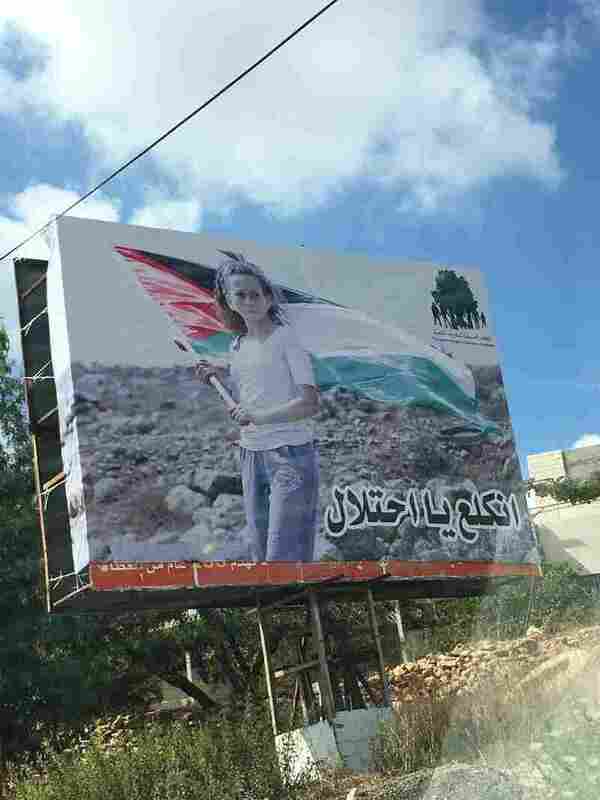 Tamimi's protest gained international attention and many human rights groups were critical of her detention. Amnesty International called her release "welcome news" but stressed that other Palestinian minors are facing difficult circumstances in Israeli prisons. "Ahed Tamimi's release must not obscure the familiar and continuing story of the Israeli military using discriminatory policies to lock up Palestinian children," said Saleh Higazi, the head of Amnesty's Jerusalem office. "Her unjust imprisonment is a reminder of how the Israeli occupation uses the arbitrary military courts to punish those who challenge the occupation and illegal settlements expansion policies, without any regard to age." Israeli Cabinet minister Uri Ariel told The Associated Press that he thinks Israel should respond more strictly. "I think Israel acts too mercifully with these types of terrorists. Israel should treat harshly those who hit its soldiers," he told the wire service. "We can't have a situation where there is no deterrence. Lack of deterrence leads to the reality we see now ... we must change that." Ahed's father Bassem Tamimi, who is also a well-known activist, has told NPR that her altercation with soldiers happened shortly after her cousin was shot in the head with rubber bullet as he was climbing the wall of a complex that Israeli soldiers had taken control of. He said her protest was an understandable response to growing up watching her relatives be killed and wounded. Lara Hamdan contributed reporting from Nabi Saleh, West Bank.